What can I do to ensure I only erase the smaller details without affecting the area around it? I don't draw much and can't even call myself an amateur yet. As a result I make a lot of mistakes and also many test strokes when drawing. For small touch ups and mistakes the eraser is my best friend. However, my big white eraser does not help much when I need to only make small corrections. It can remove larger areas around where I am erasing. Let's say I am talking about erasing small areas less than a centimeter in diameter. What can I do to make my erasing more targeted and only affect the areas I want to remove? 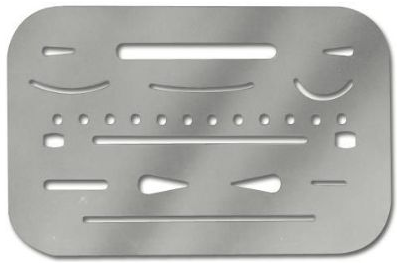 An erasing shield is a metal stencil that can mask off the parts of your drawing you want to protect, while exposing only the area you want to erase, so you can erase with more precision. I would first suggest a kneaded eraser, if you don't use one already. A kneaded eraser can be shaped like putty. 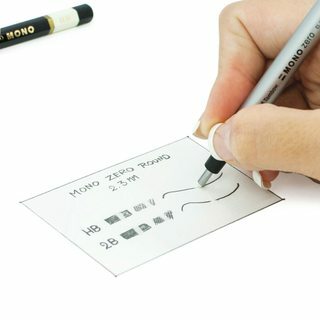 This means you can form points, lines, and a variety of other erasing surfaces with it. This allows you to easily erase just the place you want. Additionally, it doesn't erase the same way as your rubber or Mars plastic (polymer) erasers, which leave bits behind and may wear down you paper. It actually lifts up your graphite or charcoal marks. This means you don't have to brush or blow the residue away. This property also allows you to only partially erase something. For instance, you may have placed a large swath of grey that's a couple shades too dark. You can pat at the dark area to lighten it, instead of erasing it and starting over. I have tried and own eraser shields, but they don't work very well with erasers that have lost their edges. When I do use them, it's with my kneaded erasers and not my polymer erasers. In that case, they work very well as stencils for the point you knead. As for the points, you need to roll them thick and shallow instead of thin and steep, in order to have enough strength in the tip to hold up. I generally just make a ball, pinch part, and make a cone out of it. Unless you want to erase very finely, such as adding highlights to hair. In that case, you can leave the point long and thin, and it will gently lift up fine lines of pencil. Once you start using kneaded erasers, you'll find that they're really an entirely new implement, quite unlike regular erasers. Since you can adjust the amount you erase by changing pressure and eraser shape and even the way you apply pressure (standard erasing motion, patting, rolling, stippling! ), you can get very fine control over what you're doing. And you don't have to worry about erasing holes in your paper! Now, to be fair, kneaded erasers have downsides. The harder your lead (4H and up), the less effective I find these. Likewise, the harder you press with your pencil, the less effective they are, because they can't pick up the graphite dust. If the kneaded eraser won't do it, use a polymer eraser (I throw out rubber erasers). You can always use a craft knife to "sharpen" them into a point or chisel. Sharpening polymer erasers makes them work much better with eraser shields, too! 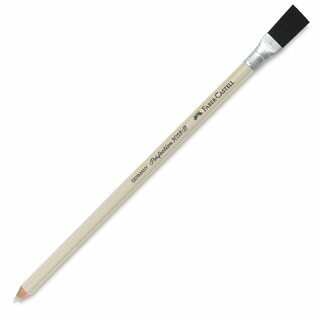 Imagine a pencil that is filled with eraser instead of graphite - that's an eraser pencil. Some models have a small brush on the back end for getting rid of eraser dust. Basically the eraser equivalent of a peel-off grease pencil. The eraser core is wrapped in paper, and as you wear down the tip, you peel off more paper to expose more eraser. The eraser can be cut with an exacto knife to make a fine tip. You sharpen it in a pencil sharpener, just like a normal pencil. They work the same way as mechanical pencils, but instead of graphite, you have a fine point eraser. Fine point, pen-style housing, refillable. 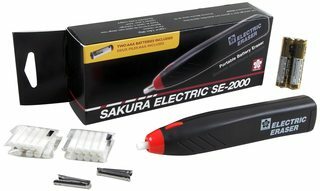 Larger point, pen-style housing, refillable (like the Tombow), but the eraser stick is much firmer than the Tombow is, so you can cut the tip into any shape you need with a razor blade or exacto knife. 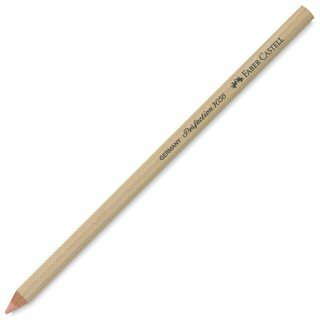 The eraser tip spins, allowing you to sharpen it to a tiny point by holding it on a piece of sandpaper at an angle. If you want to erase a smaller area without buying additional stuff, it's easy! Use a blade or scissors (I prefer blades) and cut out a pointed shape to erase with. If you are scared of wasting erasers, you can just trim the corners or cut it in half or just use the leftovers from the cut. If you have new erasers or you didn't use the bottom corners, use them! 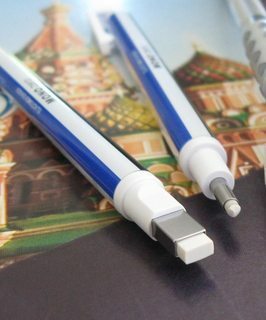 Use the erasers from mechanical pencils or from pencils. Don't erase. One of the biggest challenges for a beginning artist to overcome is this idea of a "mistake." If you get a stray mark during the execution of your work, leave it. These imperfections not only add character to your work, but they also establish the work's authenticity. As you continue to develop as an artist, your execution will improve and these stray marks will decrease. You will develop great skill at executing without "mistakes." But the best part, is that you will have generated a large body of works which have remained unedited. This will provide you with a resource to look back over the years and see just where your skills have improved and how fast. By the way, scientists do not erase their mistakes, they carefully document them. I use many erasers for drawing. I actually draw with erasers by taking off areas and texturing. So there are many uses for erasers in drawing. If you draw with only a pencil and include mistakes then that is your version or style of drawing but it is not the true and only way you should draw. The pen eraser is valuable to me because I can cut a clean edge on the tip and erase fine lines to create textures such as weave in cloth. It just depends on your style of drawing. There is no right way or wrong way. I agonized over this decision myself! I've tried a lot of different options for tiny areas and fine detail and finally settled on the Tombow Mono erasers. 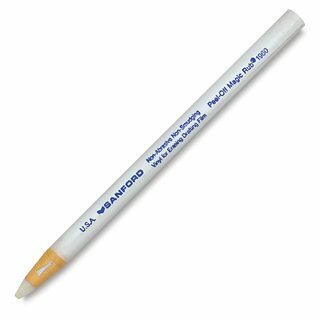 They last a while too, not like some erasers where you scrub them down to nothing after a couple uses. 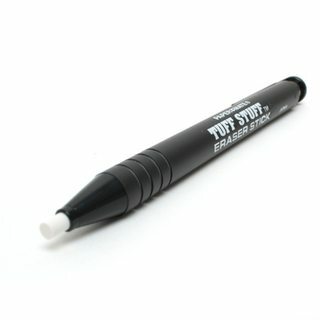 Good for when you need to erase very thin lines in tight spaces. If you're working with paper that is fragile or liable to scrub away with too much erasing, use a standard kneaded eraser. No eraser "crumbs" to clean up, and you can break off a small chunk and twiddle it to a very fine point. 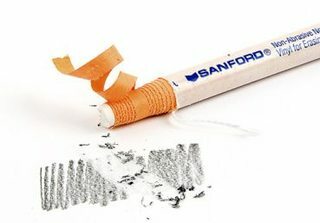 Rather than scrubbing back and forth with this type of eraser, you would kind of dab it on the paper repeatedly. It sticks to the graphite particles and pulls them up, and then somehow doesn't transfer back onto the paper. For drawing, I would advise staying away from the "eraser pencil" options. They're horrendous and either smudge/smear your work, or leave weird un-erasable grease marks. It functions by adsorbing and "picking up" graphite and charcoal particles, in addition to carbon and pastel marks. It does not wear away and leave behind eraser residue, thus it lasts much longer than other erasers. Although kneaded erasers do not wear away like other erasers, they can become saturated and unable to absorb any more graphite or charcoal. In that case a kneaded eraser will actually leave marks on the paper instead of erasing them. However, that is to be expected. It can not last forever. Since they are not expensive, buying another one will not be much of a problem. Where I live they cost around 1 - 1.5 euros each. You can read more about them on the wiki page I shared. If want a cheap solution, I would suggest cutting a regular eraser into what Wad Cheber has suggested. Also, you might want to blow off the place where you are erasing and brush off the tip of the eraser periodically while erasing to get clean surface after the erasing has been done. You can keep a knife erasure handy along with a putty erasure. Should be sufficient for most needs. My bad folks, my suggestion was not really descriptive. To be honest, knife eraser is my term. What I meant by knife eraser is a flat retractable erasure encased in a holder, much like the retractable pencil sharpening knife. This has a sharp edge which helps to precisely erase and the retractable casing ensures that the edge remains sharp for long. I could not find any pictures for the same, will add one soon.